UK: Government adviser the Energy Technologies Institute (ETI) believes the UK can reduce offshore wind costs further by absorbing consenting costs and a greater focus should be placed on floating foundations. The ETI was looking over its ten years of researching offshore wind and has released data from its analysis. It cited the recent example in the Netherlands, where the government absorbed consenting costs for a project, allowing Dong Energy to win the Borssele I and II project tender at €72.20/MWh – a price that also excludes transmission costs. The ETI said the UK already had a ready-made consenting manager in the Crown Estate, the landlord of the UK's seabed. "The ETI believes that by taking another approach and potentially absorbing consenting costs, this could become a gamechanger for the UK market by making offshore wind more attractive to investors," the institute said. The ETI – a public-private partnership between global energy and engineering companies BP, Caterpillar, EDF, Rolls-Royce and Shell, and the UK government – also said a greater emphasis should be placed on developing floating foundations. From its research, fixed-bottom foundations are still the most cost-effective in water depths up to 30 metres. 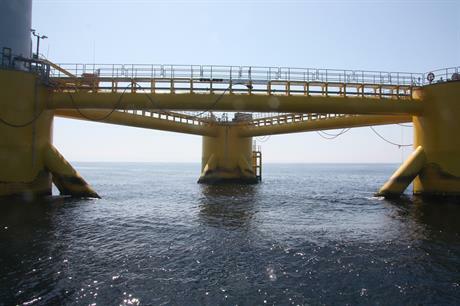 However, beyond 50-metre depths "floating foundations would provide the lowest cost solutions", the ETI said. Longer, modular turbine blades could also help push costs down, the institute added. "We have identified that the consenting and approval process should be streamlined as this can have a negative impact on developers wanting to build larger offshore wind farms. "And our work shows that the advancement of floating technology also looks like it matters because it opens up more of the sea bed and we recommend that more emphasis should be placed on floating turbine development as they should be more economic for high wind, deep water sites – the best locations to exploit UK resources," said ETI offshore renewables programme manager Andrew Scott. Following the report from the ETI, independent advisory firm the Carbon Trust has launched a series of tenders to "assess technology challenges associated with floating offshore wind". The list of tenders includes looking at the electrical systems, mooring, infrastructure and logistics, and cable condition assessments for floating wind projects. "Floating wind presents an opportunity to harness strong wind resource in deep water locations, unlocking new markets for offshore wind. "However, a number of novel challenges will need to be addressed in order to deploy floating wind turbines at commercial scale. These projects will aim to assess these challenges and identify future innovation priorities for the sector," said Carbon Trust manager Rhodri James. In June 2015, the Carbon Trust issued a report stating that floating wind projects could deliver energy for as low as £85/MWh (€119/MWh) by 2050, if the market reaches commercial scale and technology advances are consolidated.